If it is fishing you are after, you have come to the right place! Mac Attack Fishing Charters offer the best in fishing in one of the most sought after spots on WA’s coast. We have several survey charter vessels like “Mac Attack” approximately 30 foot long, aluminium mono hull with a top speed of 35 knots. Capacity to carry 9 paying customer. All customers must comply with the terms and conditions of carriage. Our vessels work out of Monkey Mia and Denham in Shark Bay Western Australia. Our skippers are highly skilled Shark Bay charter fishing guides. That hugely increases your chances of catching trophy size snapper, cod, coral trout, spanish mackerel, mack tuna and other highly prized sporting species. 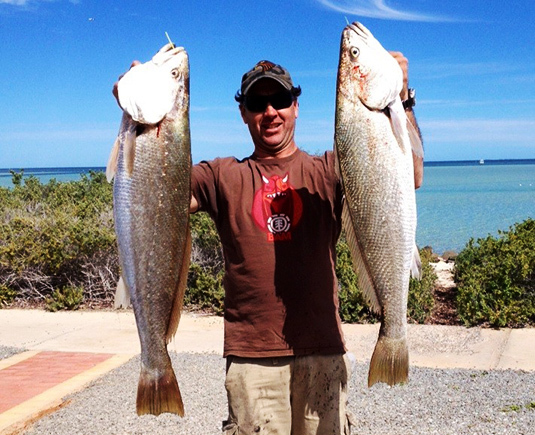 Shark Bay is an outstanding Western Australian fisherman's paradise. Fishing Shark Bay will be the experience of a lifetime because your Mac Attack skipper has unique knowledge about the local fishing grounds, knowledge which increases day by day. That's something which really matters if you wish to realise your expectations! For prices and more information click here.